EENet presents Inqboard, a collection of infographic posters. 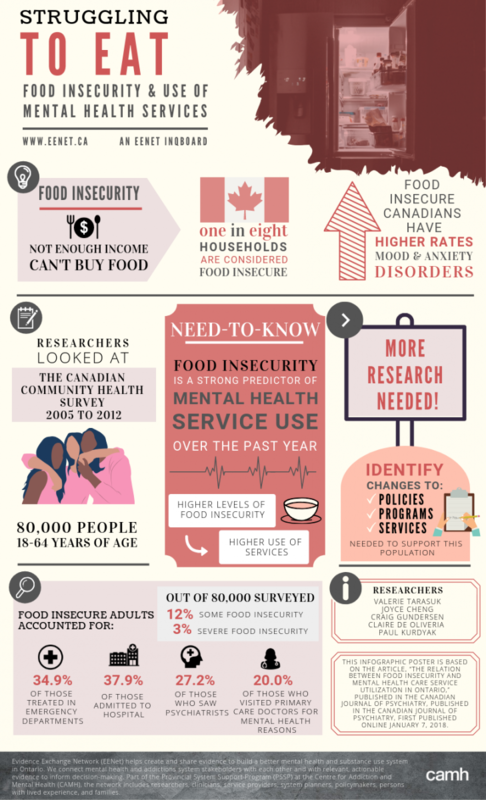 This Inqboard is based on the article, "The relation between food insecurity and mental health care service utilization in Ontario" in the Journal of Psychiatry by Valerie Tarasuk, Joyce Cheng, Craig Gundersen, Claire de Oliveria, and Paul Kurdyak. Click on the image to download PDF version of the poster. Click here to see the original study. Answers to your questions about the new staged screening and assessment for mental health and addictions.